When Kobo briefed me on the release of its new e-reader, a company rep explained that the company “[wasn’t] sure if there was a premium price point” when they released the Aura HD back in 2013. At 6.8 inches, it was larger than the long-time industry standard six inches, and it had a high-res screen and price tag to match. The Canadian company has never been afraid to take risks with the often-boring world of e-readers, and for that reason alone it is a welcoming presence. 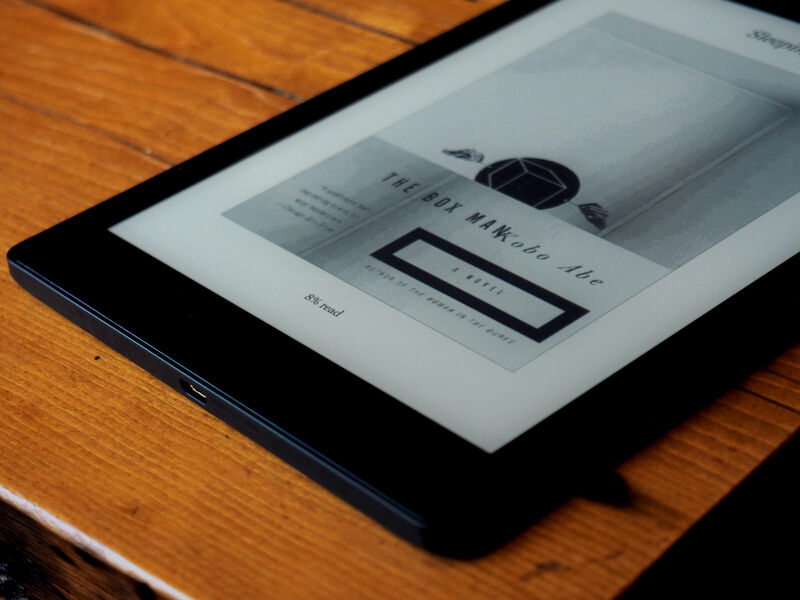 Without Kobo pushing the boundaries of screen size, build quality and features like waterproofing, it’s hard to imagine much innovation occurring in the Amazon-dominated space. With the Aura One, the company is doubling down yet again, with a 7.8-inch display that utterly dwarfs the Aura HD and a $230 price point to match. Even with a handful of other welcome add-on features, that’s a pretty lofty price tag for a devoted e-reader when Amazon’s Kindle Voyage starts at $30 less (the Special Offers edition, at least). But Kobo’s previous attempts to go all in have paid off before, and while the company will likely be the first to admit that the Aura One isn’t for everyone, it gives the sort of person willing to shell out more than $200 for such a device exactly what they’re looking for: the ultimate e-reader. That’s the thing about e-reader displays: All roads lead to six inches. 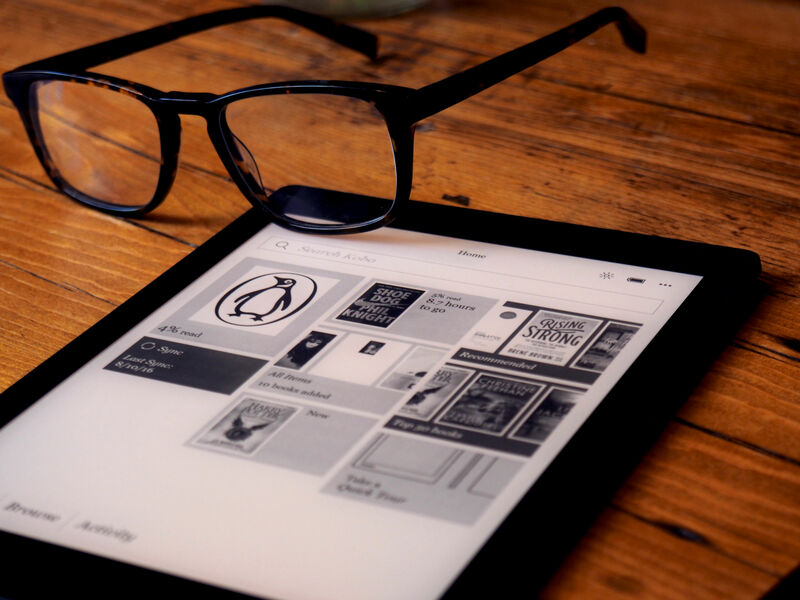 Both Kobo and Amazon have experimented with different screen sizes, and both keep coming to the conclusion that the pull to return to a standardized size is just too great. After all, it’s large enough to replicate a full page and compact enough to slip into a pants pocket when you’re done. So, naturally, Kobo has gone ahead and made its largest screen yet. The added real estate means fewer page turns. It’s also a bonus for readers who need large type and people who use their readers for PDFs, which can be a ginormous pain on a smaller screen with all of the pinching and scrolling. And 7.8 inches, it turns out, is big, but not unwieldy. Stashing the reader in your pocket is suddenly out of the equation. Reading with one hand for bus and subway travelers may or may not still be in the cards, depending on how big your hands are (the jury’s still out on certainly presidential candidates). But the Aura One weighs in at 230 grams and features the slimmest profile of any Kobo yet at 6.9 millimeters, so marathon reading sessions won’t be an issue. That newer, slimmer profile is due, in no small part, to the flush display, one contiguous piece of glass that meets up with a slight lip on the side. The bezel’s still sizable, containing a small dark gray Kobo logo at the bottom and a barely visible light sensor at top. 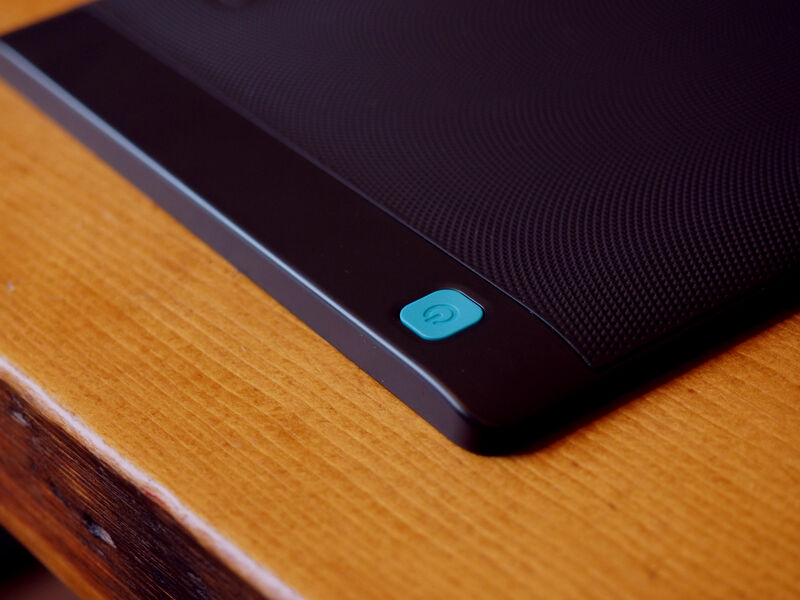 The rear of the device is striking — at least so far as the backs of e-readers go, with slightly tapered sides that create a subtly convex surface covered in a textured soft-touch material. Up top is a big, teal power button — the only physical button on the reader, which, sadly, doesn’t have the physical page keys recently re-adopted by Amazon for the Kindle Voyage. There’s a microUSB port at the bottom — it’s probably too much to ask for USB-C when not even every phone maker has adopted the new standard yet. Even with that exposed port, the reader still manages a water- and dust-resistance rating of IPX8, meaning it can be submerged in up to two meters of water for up to an hour. That offers up some interesting potential reading scenarios, but for most readers it just means you can accidentally drop it in the tub without breaking the thing. 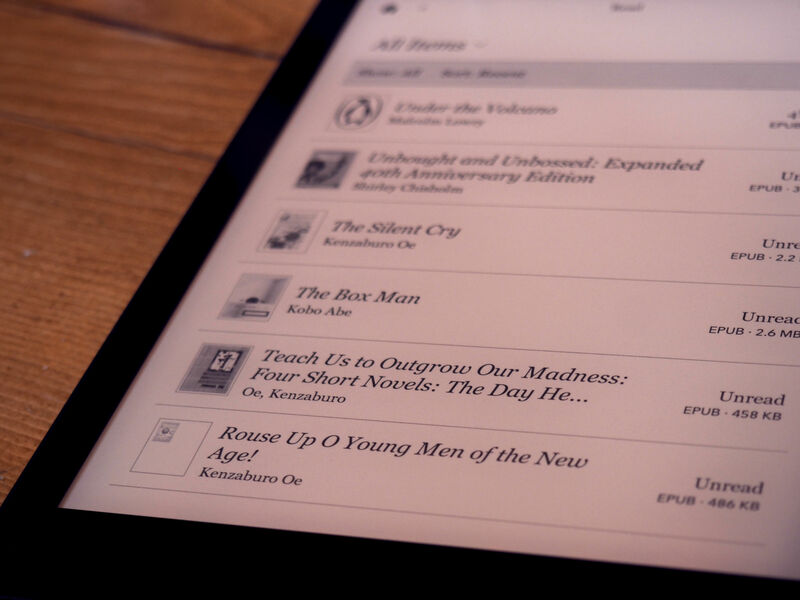 The E Ink display sports an 1872 x 1404 resolution, which works out to 300 ppi — the same as what you’ll find on the Kindle Voyage and the last-gen Glo HD — i.e. about as sharp as reading real text on a real page. You know all of the e-ink trade-offs by now. In the pro column, it’s crisp, clear and visible in sunlight, with a ridiculously low power consumption. But it’s monochrome and has a much longer refresh rate, which hasn’t seen all that much improvement in recent generations. Of course, the device’s inability to offer a half-decent web browser experience is either a pro or a con, depending on who you ask. After all, keeping this a purely readerly experience means completely ditching all of the social notifications and other distractions — as if you don’t already have all of the info pushed to enough devices already. The real differentiator on the screen front is the addition of the ComfortLight Pro to the device’s front lighting technology. Like the rest of the hardware world, Kobo’s getting on the sleep train, adjusting the screen’s blue light level so it doesn’t screw up circadian rhythms before bed. The device can either do it automatically using a light sensor adjusting over the course of the day, or the user can set a predetermined bedtime for the system to switch over to a far more reddish hue. This is definitely a handy addition, given the fact that the front lighting was designed to be read in bed. So, what does the Cadillac of e-readers have under the hood? Processor-wise, you get a 1Ghz Solo Lite iMx6 processor, the same speed you’ll find on the Aura HD and Voyage. That’s coupled with 512MB of RAM. 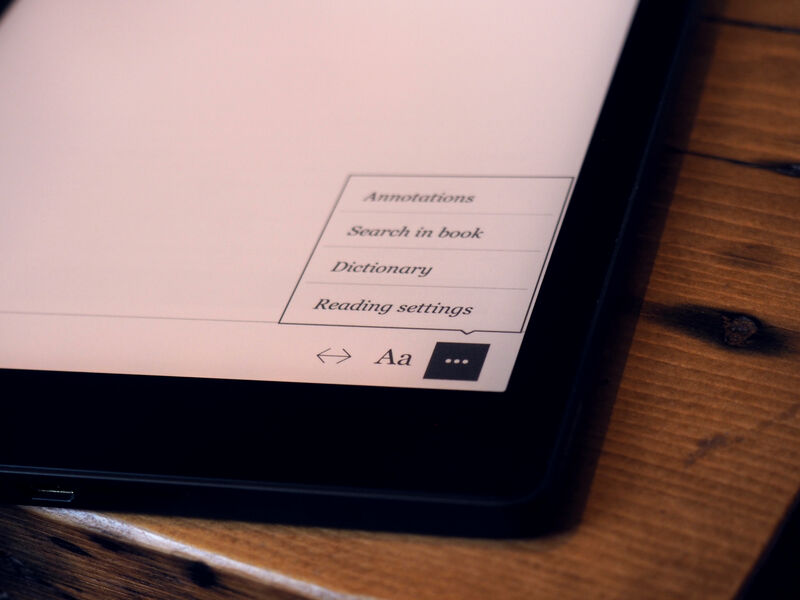 It all makes for quick page turn speeds, but those who haven’t spent much time with a devoted e-reader will find the device’s response time slow and finicky compared to what you get on a tablet. It’s not really an unfair comparison, but it does underscore the fact that, screens aside, e-reader hardware hasn’t improved too dramatically over the last couple of generations. Storage, on the other hand, isn’t a problem. Kobo went right ahead and doubled the Aura HD’s storage to an extremely healthy 8GB. There’s no option for expandable storage, but at an estimated 6,000 e-books, by the companies count, you’re probably OK. And, as usual, you can drag and drop files directly onto the reader from your PC, including EPUB, MOBI, PDF, CBZ and CBR (for comics) and a variety of image types. 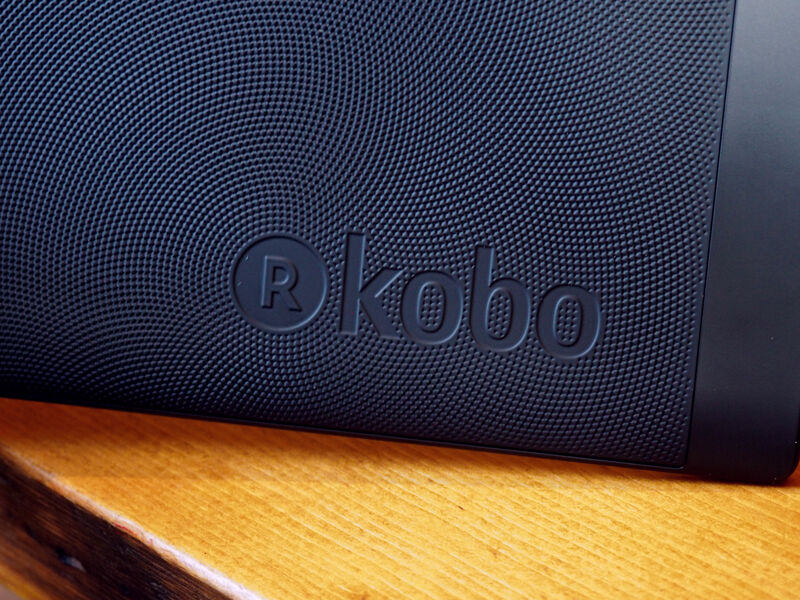 It’s an openness that continues to distinguish Kobo’s devices from the competition. The battery life takes a bit of a hit this time out, owing, at least in part, to the much larger screen. Kobo has halved its battery life estimates from the previous generation — though “up to a month” should still be plenty of time between charges. No matter how you slice it, that’s a lot for a devoted e-reader, and Kobo doesn’t have the same benefits as Amazon’s aggressive hardware subsidizing (though the fact that it’s now owned by Japanese e-commerce giant Rakuten undoubtedly helps) or a Special Offers-like promotion. That undoubtedly makes the device destined for an even smaller niche within the already relatively small world of e-readers. But Kobo once again gets some points for thinking outside of the e-reader mainstream, and while the Aura One probably isn’t worth the price of entry for most readers, the devoted few will find a lot to love, including a massive screen, blue-light shifting, a nice design and a whole lot of storage.